The entrepreneurial spirit in the country is riding a wave that everyone else sees as a validation for the start-up culture, and perhaps rightly so. The bitter truth: For every story that’s got a happy ending, there are countless which simply vanish in the marketplace. So, what’s that one start-up, entrepreneur, and a successful person doing that the rest aren’t? The answer to that question is difficult, and that’s why we have picked five books from five of the smartest people on the planet, that every person in the business should read. Nirmalya Kumar, a Lee Kong Chian Professor of Marketing at Singapore University and a distinguished fellow at INSEAD emerging markets, is famous for his blog posts on the Indian economy, and popular culture that’s in the arena of business. His latest book, Thinking Smart, offers insight into achieving everything – from creating a winning team, handling a delicate relationship to firing people in the organisation. Add this book to your cart here. If you run or manage a business, Anil Lamba’s (a bestselling author and a financial literacy activist) Romancing The Balance Sheet has to be the go-to book. Touted as a guide for managers and businesses who want to maintain a perfect balance sheet, manage cash flow, expenditure and get the most out of every penny spent, Anil Lamba does a fantastic job of explaining even the most verbose of concepts in simple terms. What does the CEO really want from us? It’s A question that haunts every manager in every organisation. Bringing insight from his over 45 years of experience, R Gopalakrishnan, in his book, discusses how the business environment is constantly changing, that success is slowly becoming an ambiguous concept and how to best perform within an environment so you gather from those above you. Questions that take years to get answered are right in the book for you to find out. Add this to your cart here. The CEO of Microsoft, in his new book, Hit Refresh, discusses the inside story of Microsoft’s transformation, and his personal journey from childhood in India to leading one of the biggest corporations in the world. The book puts forth how people and organisations, along with societies must transform to get to the next big thing. Raghuram Rajan famously predicted the onslaught of Sub Prime Crisis, way before anyone else had any idea what it would mean for the world economy. Coming from perhaps the smartest guy in the room, this is a book about India’s monetary policy, problems of the free-falling rupee, inflation, deficit and more. 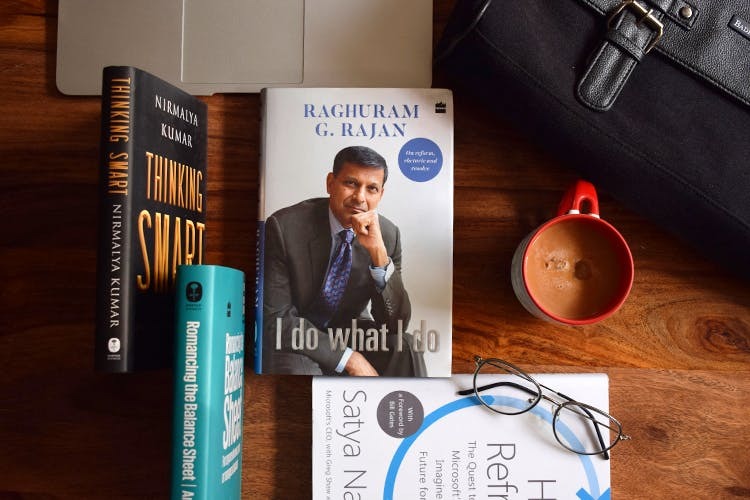 The book is about Rajan’s intervention as the Governor of RBI and the steps he took to correct the economy and bring confidence in the Indian institution. Essentially, it is about leadership, taking actions in the face of uncertainty and going all out on a strategy. So, this was our list of books that we think will help amateur entrepreneurs who are still looking for direction. And even if you are a successful person, reading these authors will fill you with new insights into the world of ever-changing marketplace.